give an R Value of 1.7, and have a high air flow system which minimises wind damage to crops. Extend your growing season, with a large range of sizes available, proven to withstand wind speeds of 140mph. 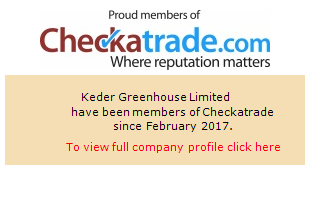 Welcome to Keder Greenhouse, the specialist builders of protected growing environments using the unique Kederbahn bubble plastic and rail system. This cost effective alternative to traditional glasshouses is not only safer, but long lasting, while it is also stronger and more durable than poly tunnels. Keder structures provide fully diffused light, no shadowing, and strength which can withstand the winds of the Falkland Islands, the snows of the Scottish Highlands, and the soaring summer temperatures of mainland Europe.